There has never been a greater time to homeschool OR to pick up a new language. With countless resources at our fingertips, the problem is not getting information– It is wading through the overwhelming quantity of information to seize the best, most accurate, and most concise information. 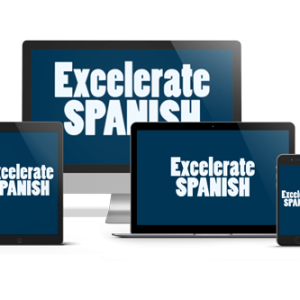 So how are we to save both time and money and still find a Spanish curriculum that pleases us and our students and prepares them for a brilliant future? First, zoom in on the actual order of the content. When you are evaluating a program, ask yourself– Is this the same type of tired old material that didn’t help me as a student? 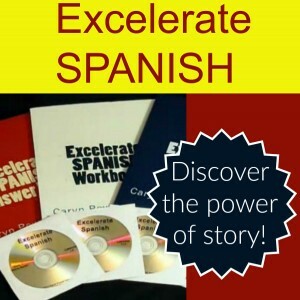 Textbooks and curricula that start with greetings/goodbyes, grammar lessons from the very beginning, and lists of things to memorize– Those are your cues to look elsewhere! That is not how anyone alive ever learned their first language, right? So what content do you look for? Aim for programs that center around high frequency vocabulary— the real words spoken in the real world by real native speakers. The best programs will start with the “super 7 verbs” and other high-frequency vocab. These powerful building blocks equip students to respond to practical, everyday situations with remarkable success and ease! 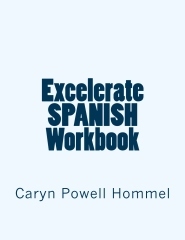 So how does Excelerate SPANISH do on this score? Well, the level one program teaches one of these “super 7 verbs” as the very first word students learn. The word “va,” or “goes,” is presented via gestures and clarified using English. Students see the spelling of the word, hear its pronunciation, practice a gesture, and immediately begin combining the verb with various nouns, forming complete sentences within the first five minutes! A second aspect of content I like to consider is what I call “connected discourse.” One extremely popular computer-based language program comes to mind. It does a great job of entertaining learners with alluring visuals and connects these to authentic speech, but it doesn’t stick with a subject for more than a few seconds. This means that the “follow-through” that our brains expect and relish when we are listening is simply missing. What an example of working harder, not smarter. This is the opposite of what we want for our students! In contrast, a great foreign language curriculum will offer plenty of robust “comprehensible input” because (of course) input always precedes output. This input will be most valuable if it is compelling (humorous or meaningful to the student), understandable, and contextualized. A good story offers each of these components. Think about it: Stories have long been used with amazing results to teach concepts in all content areas. Our brains love and latch onto a good story! What better way to engage your students? After you examine the content of a curriculum, you’ll want to pay attention to how it is delivered. Many things help us to assimilate and recall new information: word associations, visuals, hands-on experiences, etc. How does your student learn best? Visual learners will benefit from visual representations of the material, while kinesthetic learners need to try things out for themselves, perhaps even “applying” concepts before communicating observations and conclusions. This is often the case with scientific experiments, game play, and so on. Finally, look up reviews on the options you are considering. What are others saying? If you make a purchase and find that a curriculum doesn’t work for you, can it be returned? If you need support, will it be available to you? Please let me know if I can assist you as you go about this process! As a fellow homeschool mom, I have been there and understand what it means to you and your family to choose the right fit for each subject. Don’t hesitate to contact me with your questions or concerns; I’m here to help! 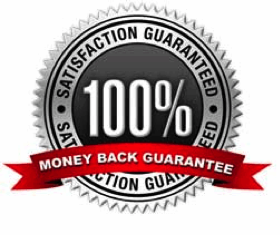 90 DAY GUARANTEE Love it or your money back!